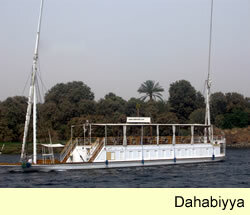 This the exterior of their boat, a sandal a small version of a dahabiyya(spellings vary). 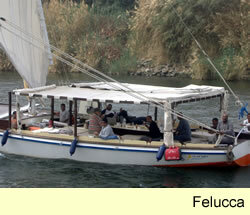 As this is a smaller boat it is suitable for a small private group. The maximum capacity is 8 people. The interior of the boat has a lounge but most guests enjoy life on deck. There is an awning to protect you from the sun. The bedrooms are fully furnished with bathrooms. The views along the way mix historical sites with rural life and natural scenery. 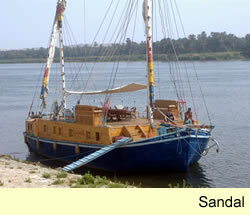 The owners of Sail the Nile and the crew do everything to make your experience perfect. Mahmoud meets guests and takes them on board. He and Jane are always available at the end of a phone should there any translation difficulties. The crew will do parties and barbecues in fact anything you want. As well as sailing the boat, housekeeping and all meals.